I’ve been lucky enough to be serving as a camp counselor this year at a local summer camp! But, with a wonderful experience comes the problems of clothing. I need to pack the bare minimum (so my small suitcase won’t explode! ), while still having enough clothes for a new outfit every day. Any tips? Your problem is one that many of us face at some point–How to pack (very) lightly while still staying stylish?–but luckily, all you need to solve this problem is a bit of ingenuity. I’ve answered a question about packing a capsule wardrobe before, but what you seem to need is something even smaller than that — I like to call it a mini capsule wardrobe! So, similar to what I did with my previous capsule wardrobe, I’m going to deviate from the usual Ask CF format and show you the full mini capsule wardrobe, and then five ways to mix and match the pieces in it to create a variety of stylish looks. Remember that there are many different ways that you can style the pieces in the mini capsule wardrobe; don’t feel like you need to stick with these combinations all the time. In order to maximize your wardrobe (and suitcase space), the best way to pack a mini capsule wardrobe is to ensure that everything can be mixed and matched, and that the colors in the wardrobe all go together. The easiest way to do this is by sticking with neutral colors, as I did for this summer camp packing list, but feel free to add a few pops of color; for example, with a bright red t-shirt or a coral scarf. 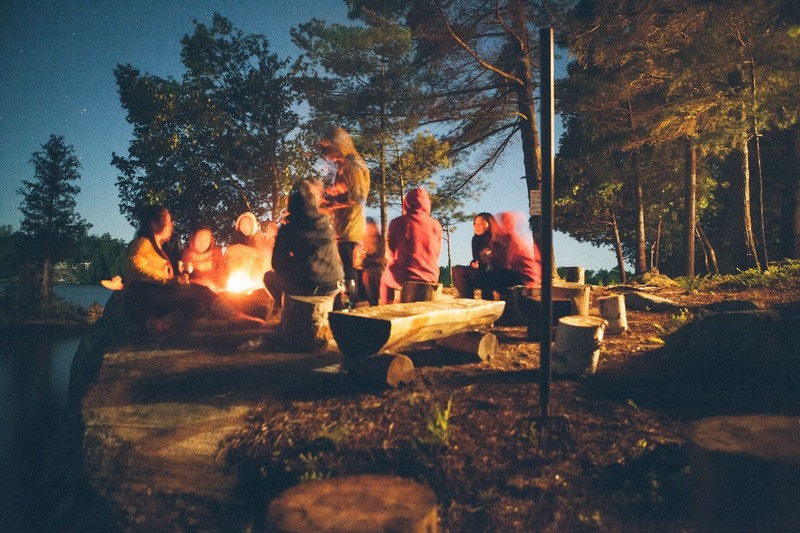 Also, since you’re going to be in a camp environment, in which things tend to get messy, make sure that everything you bring can be washed and/or wiped off. Finally, feel free to add and/or take away items from this wardrobe based on your needs. Since you mentioned that your suitcase is “tiny,” I only created four everyday warmer-weather outfits, plus a swimsuit look; however, I don’t know how long you’ll be working or what the temperatures will be like, etc., so you may need to add a few more pieces, or pack heavier clothing if it’ll be cold at night. There are lots of things that I love about this outfit, but the main selling point for me is how versatile it is; if it’s too hot for a jacket and a scarf, simply remove them and stow them in the backpack. To get the look, first pair a loose-fitting striped tank with a pair of crisp white denim shorts. 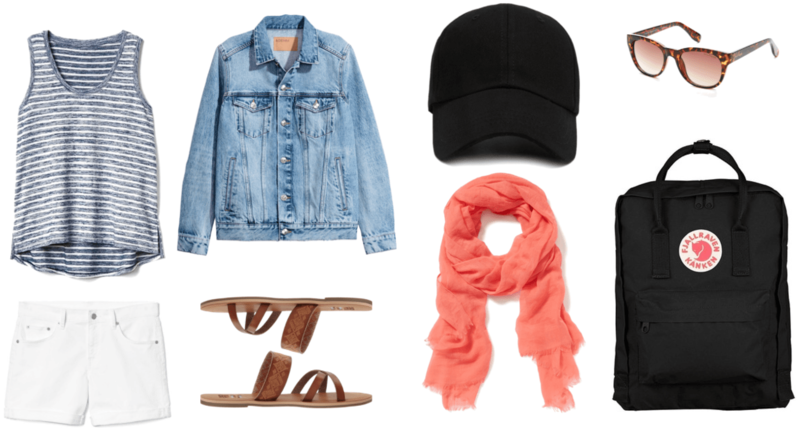 Next, layer on a light-wash denim jacket, and wrap a cute coral scarf around your neck. A simple black baseball cap and classic wayfarer sunglasses will help to shield your face and eyes from the sun (but don’t forget to put on sunscreen as well!). Lastly, put on a pair of comfortable flat sandals, and grab a no-frills black backpack. This one is perfect for storing your essentials for the day — and it won’t show stains if you put it down somewhere dirty. If you want to take a sleeker, more minimalist approach to to your look, try a simple neutral-colored outfit. To achieve this aesthetic, put on a gray v-neck t-shirt, and tuck it into a pair of black chino shorts. Gray Converse, a black baseball cap, and wayfarer sunglasses add a tomboyish touch, while white ankle socks keep you comfortable without interfering with the rest of your look. Put on a braided belt to add some texture to the look, and finish off by carrying your black backpack. This outfit is perfect for nighttime, or even for cooler days; if it gets really cold, add the denim jacket for extra warmth. Begin by half-tucking in an easy striped long-sleeved t-shirt into a pair of relaxed boyfriend jeans, so as to show off the braided belt. Next, layer on a plain gray sweatshirt and the coral scarf, both of which will keep you warm in chilly temperatures. 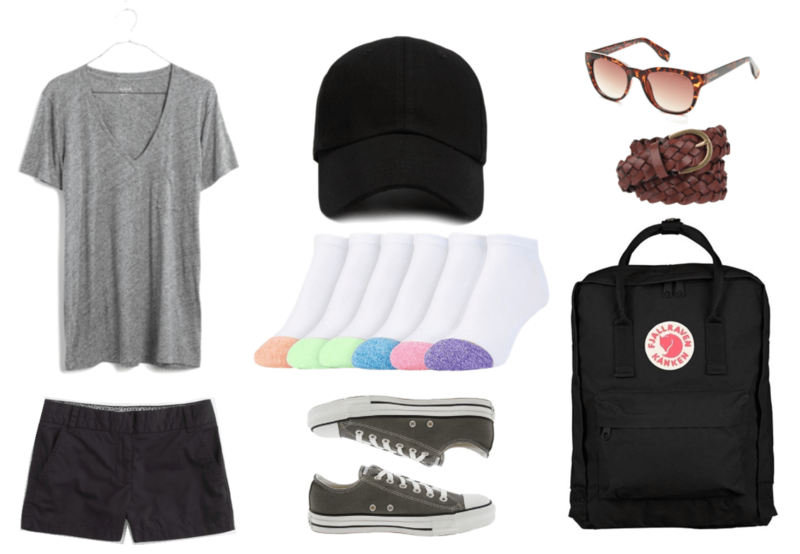 Put on the Converse, white ankle socks, and black backpack, and you’re all set to go! This outfit is a great example of how to mix bright colors and neutrals, while still maintaining a cohesive look. Start by putting on a fun bright red t-shirt and an adorable pair of denim cutoffs. 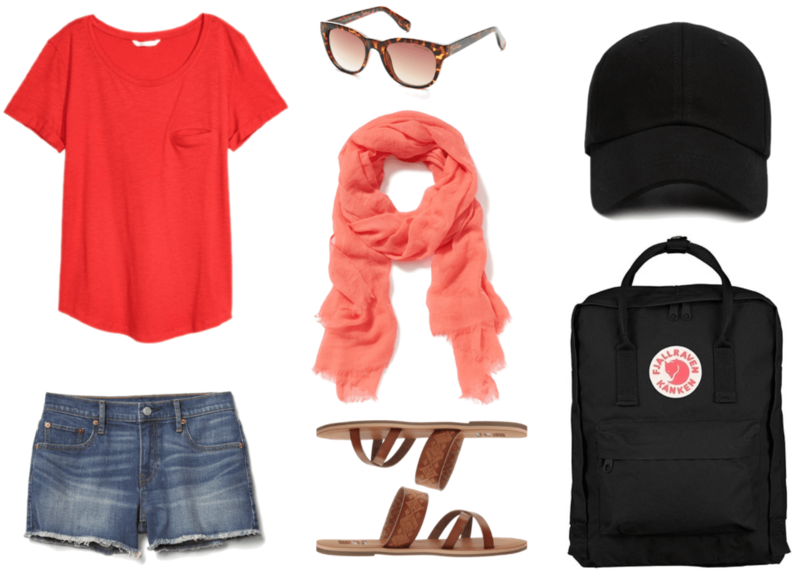 Next, accessorize with the coral scarf for some chic contrast, as well as the wayfarer sunglasses and black baseball cap. Complete the look by sliding on the cognac-brown sandals and wearing the black backpack. In your letter, you didn’t mention whether you’d be swimming during your time at camp; however, since most camps involve water-related activities, I’ve chosen to include a bonus swim look. This ensemble is based around a sleek one-piece swimsuit, the perfect option for chasing after campers without suffering any wardrobe malfunctions. For walks to and from the water, add a pair of cheap and chic flip flops (in a dark color to hide dirt! ), and bring along the black backpack to carry your clothes/swimsuit, towel, etc. Normally, I’m an advocate for a stylish swimsuit cover-up; however, given your lack of suitcase space and casual environment, I think it’s okay to layer one of your t-shirts over your swimsuit. The gray one works perfectly, as it is loose enough to stay comfortable when you’re wearing it on top of a wet swimsuit. However, if you do have extra space left in your suitcase, check out this article for some cute under-$40 swimsuit cover-up options! Now you know how to successfully pack a functional and fashionable mini capsule wardrobe for your job as a camp counselor. Have fun, and thanks for your question! Have you ever had to create a mini capsule wardrobe, and, if so, what did you include in it? 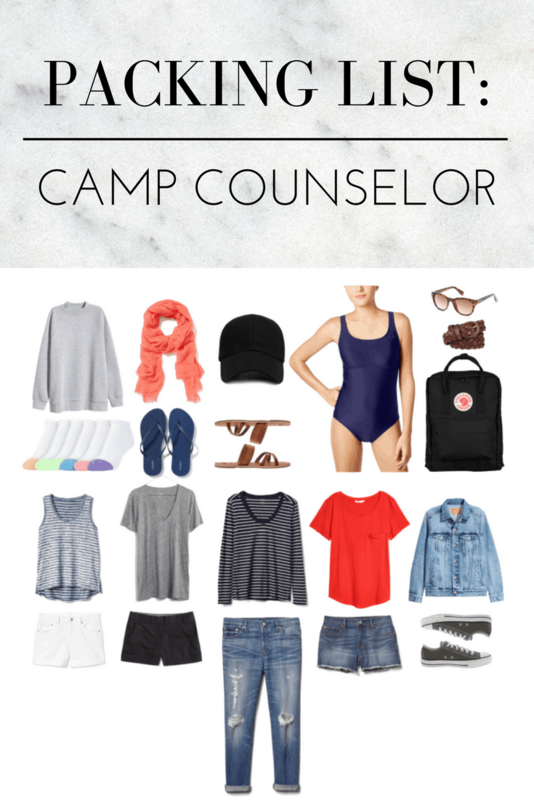 Do you have any advice on how to be a stylish camp counselor? What about practical tips on what to wear in different camp-related situations?